“Know my problem with you, Romero?” Zinzer moved close, pointed in Romero’s face. Peter Romero debuts in Mining Sacred Ground, A Peter Romero Novel is a recipient of the Public Safety Writers’ Association Award, 2013, and an Eric Hofer Award for Fiction, 2014. 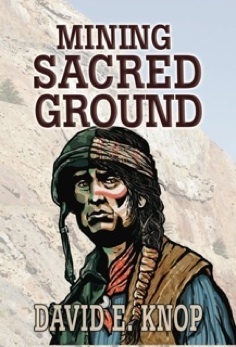 In the award-winning, Mining Sacred Ground, former Marine Peter Romero is called to mete out justice while protecting a secret five hundred years old. Romero battles self-doubt, threats of divorce, hostile law enforcement, and a killer’s cross-hairs through Arizona back-country. Knop serves full helpings of character, plot, and human interaction in a narrative that lurches into a narcotic desert night-scape. Mining Sacred Ground, A Peter Romero novel, is available on Amazon.com, Barnes & Noble.com, and iTunes. -Ken Kuhlken, award winning author of Midheaven and six Hickey family mystery novels set throughout 20th century California. kenkuhlken.net. -Gene Riehl, author of Quantico Rules and Sleeper, FBI thrillers from St. Martin’s Press.